Nestled in the majestic Himalaya mountains, the peaceful kingdom of Bhutan is quite strange to many people, but converges the happiest things of the lower world. 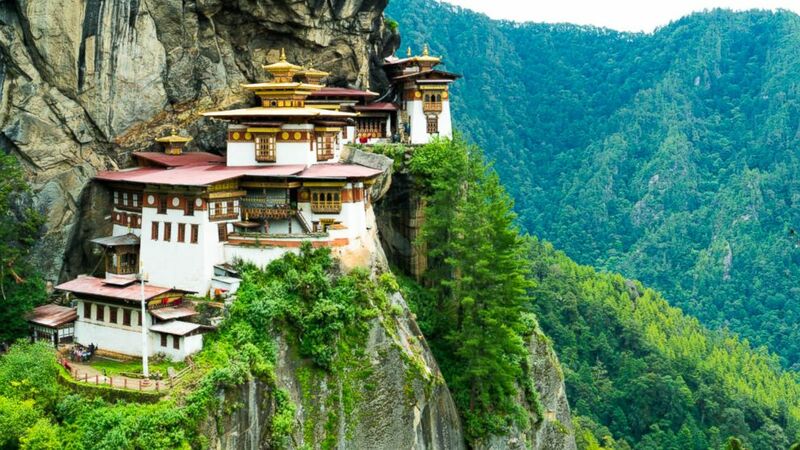 The small nation of Bhutan is known for the world’s highest happiness index,located in the eastern Himalayas, between Tibet (China) and India. The people of Bhutan call their country Druk Yul, meaning “the land of the Thunder Dragon” – associated with the legendary Dragon Thunder, making everyone who once set foot appreciate life and feel like living in paradise. The majority of Bhutanese people follow Buddhism, the Buddhist mark is very clear in the cultural life when the majority of Bhutanese who study at Buddhist Schools or wherever you go see the Buddha’s flag flying in wind. Bhutan is known not to rely on skyscrapers or great buildings, but because of the quietness, separation from the world: there is no distinction between rich and poor, there are not many billboards, not massively developing the tourism industry. Bhutan has only one airport, with an airstrip, where the plane can only go up and down during the day, in good weather. Preserving and protecting the natural environment is a concept deeply embedded in the subconscious of every people here. They have a sense of self-awareness when they see a broken tree, they will grow three other saplings as a way of “compensating” for their mother nature. Arriving in the small town of Paro you will see the clean and peaceful streets, adorned with lovely traditional houses with elaborate carved frames, hung with chillies of ripe chillies. From the far side, Rinpung Dzong ancient monastery is located on a hillside with a dzong-style architecture (fortress) that looks as though it appears from a distant past. More interesting is still climbing through the mountains of the same message to visit the famous Taktsang monastery. This is the most sacred place of the Kingdom of Bhutan and is revered by Buddhists. The monastery is located on the high cliffs in the middle of the clouds overlooking the beautiful Paro valley. Whether you come here by any way, it feels like you are lost in the first place. On the way to Thimphu Capital, you will admire the tall pine trees glistening by the sun and the clear streams flowing between the rocks. Tashichho Dzong Monastery is located on the banks of the Wang Chhu River, which is the workplace of the Bhutanese monarch and the ministries and agencies most visited by visitors. On the highway from Thimphu to Punakha, especially the stop at the 3100m high Dochula Pass, zooming out of sight you will see the majestic Himalayas and the buffalo are grazing. Pristine nature also leads you through the old forest and fresh azalea carpet to explore Phobjikha valley, visit people’s houses to learn more about the lifestyle, customs and enjoy ara drunken rice wine with beauty fanciful of legendary land Dragon Thunder.